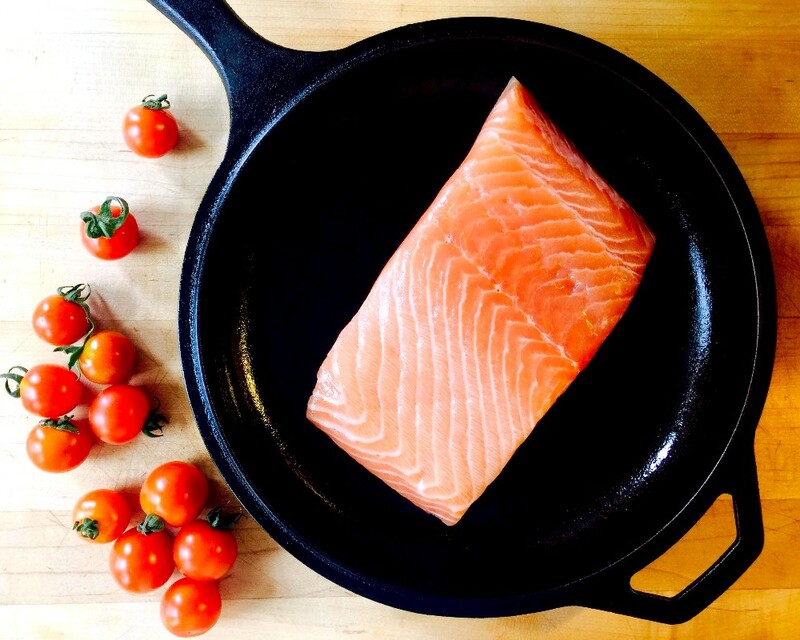 This week we are highlighting one of our favorites; gorgeous, fresh Atlantic Salmon fillets from Red's Best. We love working with Red's Best out of Boston. Their goal is "to sustain the livelihoods of American fishermen and their families while sustaining fisheries for harvest." What could be better than that? These fillets, with their soft pink hue* can take on a variety of flavors. We've provided a few recipes that will let you eat this buttery fish all day long - breakfast, lunch, and dinner. What makes salmon pink? This fish's flesh can vary from a very light pink to a deep orange color. The secret is that this this depends on the amount of carotenoid astaxanthin the fish have in their diets based on how much shrimp and krill they eat. Astaxanthin is a naturally occurring carotenoid pigment that's found in some marine plants and animals. It is recognized as being one of the most powerful antioxidants found in nature. So eat up. This pink fish is good for you. Dinner - Seared Salmon with Arugula and Tomato Salad: Can we pretend its summer still? Please? This dish is bright and reminds us of warmer weather. The Dressing for the salad calls for lemon and butter but you can sub those out for your favorite salad dressing. The blistered tomatoes will be a nice touch to mix with the arugula and will wilt the greens a bit. This calls for flipping your fish, but if you like it more medium rare (as we do!) - skip the flip. Cook skin down in your cast iron for 4-5 minutes and finish in a 350 degree oven for another 3-4 minutes. Skipping the flip keeps the flesh of the fish more moist and tender. Lunch - Salmon with Dill Butter: Again a simple, bright use of the Salmon. Same cooking hint from above applies. If you have a lemon you can follow this recipe closely. Otherwise just skip to the melting butter with the dill, some salt and pepper. Go for garlic if you have it handy. Spoon this gloriousness over your fish and call it day. Breakfast - Bagel Sandwiches: If you end up with left over Salmon - save some of that dill butter for salmon dill bagels for Sunday Brunch. If you gobbled up all of your salmon, we'd suggest slicing the bagel (with a smear of mustard, if you're into that?) and carving up the Cheddar from Brookford farm. A minute or two under the broiler, top with the fresh tomatoes, salt and pepper, add a sprig of dill and you have a delicious lunch. Spaghetti Squash: To those of you who don't think squash can be delicious, I present to you the answer to everything: More Butter and More Salt. Red Peppers: These peppers are perfectly delicious raw, as a salad topper, a snack or as a quick salsa to top your meat or fish. If you are looking for an adventure, use them as foundation for an inventive brunch dish, the Egg in a Hole. Erin confesses to be a full-fledged Salt-aholic: her favorite food group is Mall Pretzels. Adding salt to different stages of cooking not only enhances flavor at the end but helps build it along the way. There is an incredible amount of variety: Kosher, Table, Himalayan, Flake, Picking - but which salts to use when? The folks at Wide Open Eats have your answer. Having a variety to in your culinary toolbox is key - go with what you love. In our humble opinion, no household should be without Maldon Flake Salt. It is a beautiful finishing salt - you can find it in most grocery stores, online and even at Target! You will never go back.